Felder Says He Will Be Produced at the Proper Time. Notary Declares Affidavit Is Genuine. 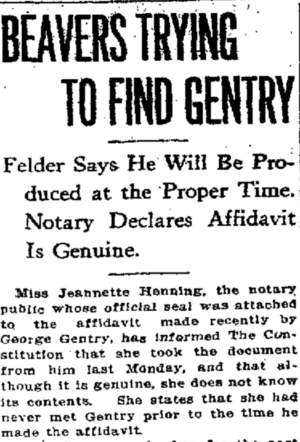 Miss Jeannette Henning, the notary public whose official seal was attached to the affidavit made recently by George Gentry, has informed The Constitution that she took the document from him last Monday, and that although it is genuine, she does not know its contents. She states that she had never met Gentry prior to the time he made the affidavit. Chief Beavers, who has for the past several days been attending the convention of national police chiefs in Washington, is conducting a search of that city for the young stenographer. He is assisted by a number of detectives put at his command by Major Sylvester, head of the Washington police department. Beavers was requested by Detective Chief Lanford to find Gentry, and to ascertain positively whether or not the youth had attested to the startling affidavit. Thursday noon, Lanford received a message from the chief saying that he was unable to locate his man, but that the search would continue as long as Beavers remained in Washington. Squad of Sleuths at Work. Lanford is apparently worried over his inability to locate the stenographer. While Beavers is scouring Washington, the detective head has detailed a squad of detectives to try and find Gentry through some local source. While this search is being promoted, Colonel Felder and others concerned in Gentry’s repudiation of the dictagraph reports, said Thursday that Gentry could be brought back to Atlanta at any time they desired. He will remain in Washington for ten more days, it is said. He was given a position as stenographer with a business firm which would last for 30 days, after which he intended returning to Atlanta and resume his connection with the General Fire Extinguisher company, with whom he has been employed for considerable time. His residence in Washington, it is stated, is obscure. He is passing under an assumed name so as to avoid newspaper reporters and notoriety. He is seen but very little on the streets, detectives aver who have talked with him, and each afternoon upon leaving his place of work, he walks hurriedly to his boarding place, remaining therein throughout the night. Before he was located in Washington, every agency of the Burns detective agency on the continent was flooded with descriptions of him in the effort to apprehend him and verify the statement that the dictagraph reports were “padded.” Less than two weeks ago a Burns operative of the Washington office, who had studied the missing stenographer’s picture, saw and recognized young Gentry as he walked home on the way from work. He was shadowed to his address. The operative wired Atlanta. Detective Miles, who is at the head of the Miles Investigating Bureau, an Atlanta concern, was sent immediately to Washington, with the result that he found Gentry at the boarding place, managed an interview with the youth, and obtained the affidavit which created a city-wide sensation following its exclusive publication Wednesday morning in The Constitution. Unusual interest is being centered in arrangements being made by the Fulton grand jury to investigate the affidavit and charges “frames-up” from both sides—the detective department and the men who claim they were victimized by the dictagraph plot. Immediate action is assured by officials promoting the investigation as is the assurance that the probe will be deep and thorough. The chief appeared to doubt the affidavit’s genuineness. He declined to express any opinion about it’s [sic] authenticity, or whether or not Gentry bad signed it. Also, he seemed in doubt that the “George M. Gentry,” whose name was signed to the document, was the young stenographer who noted the dictagraph incident. Miss Henning, who took Gentry’s affidavit, when seen by the Constitution’s Washington representative Thursday, explained her connection with the sensational document. She told of having been called over the telephone Monday and being asked to come to room 802 Westery building, which is occupied by the Louisville and Nashville railway offices. She was wanted to witness a legal paper. “I met two men in room 802,” she said, “and, after going through the usual formalities, attached my seal to the document a Mr. Gentry signed in my presence. I accepted the usual fee of 25 cents, although the men wanted to give me fifty. Miss Henning is a law clerk.